When I joined TechCrunch (and AOL, by association), I found myself swimming in company-issued bags. The standard-issue MacBook Pro came with a hefty Targus beater of a shoulder bag, and AOL saw fit to send me a Ogio backpack emblazoned with a giant purple AOL logo. I shoved them both in a closet after a few days. Instead, I lug around the Targus Spruce EcoSmart on a daily basis. 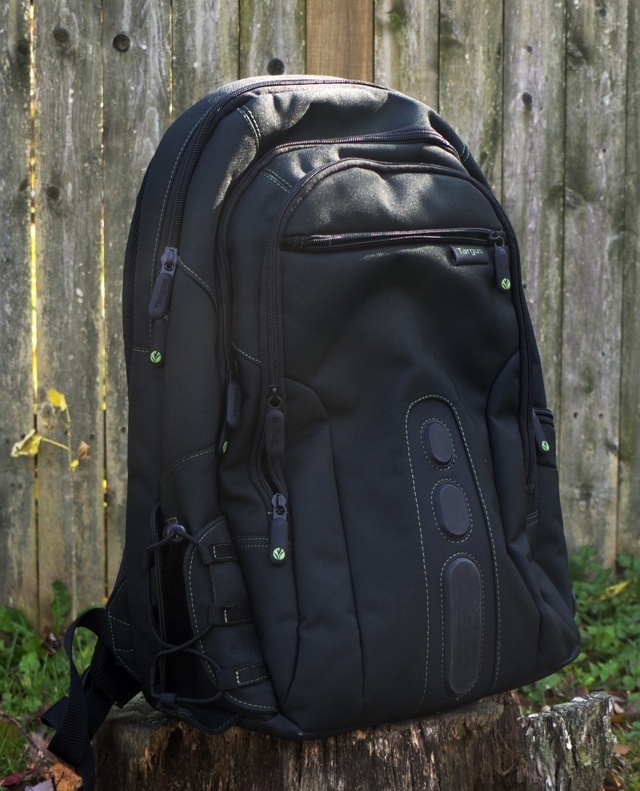 It’s not the most expensive, nor the most fashion-forward bag you’re likely to see during Bag Week, but it’s a robust, comfortable day bag that can carry most of your daily necessaries without making you regret it. If you couldn’t tell by the name, the Spruce EcoSmart was designed with the environment in mind. No, it won’t biodegrade if you hurl it in a landfill — rather, the bag’s polyester body is made out of recycled plastic bottles. Speaking of the Spruce’s body, it’s pretty nondescript at first glance, but a closer look reveals some fun little flourishes, like a series of hard rubber bumps along the front. While they actually add a bit of character to the bag’s front, they’re also meant to take the hits that come when you carry the bag around. All of the bag’s stitching is green, as are the little plant logos on each zipper. What will really catch your eye though (for better or worse) is the bag’s forest green lining. It seems like a silly way to advertise the bag’s eco-friendly schtick, but it becomes surprisingly useful when trying to dig a hard-to-see doodad out of the bottom of the bag. 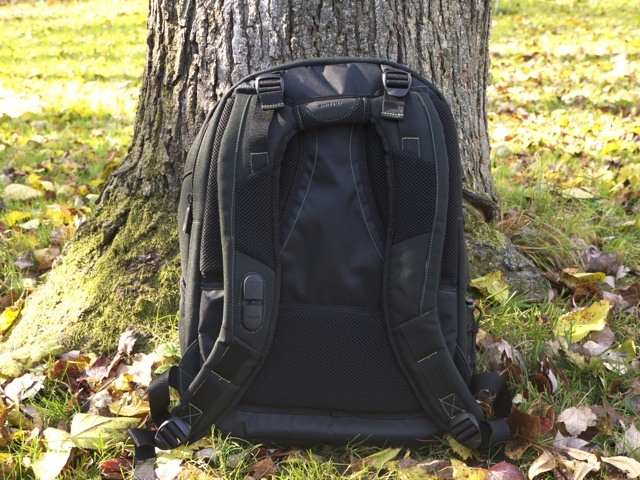 The bag’s straps are reassuringly thick, but are made of a lightweight mesh that keep the load from digging into your shoulders too much. The right strap also features a little plastic knob that the truly finicky can wrap their headphone cable around. That same foamy mesh is strategically placed near your lower back and shoulders, which makes the whole thing feel very cushy. At over 8 inches thick, it doesn’t seem like the Spruce would have much trouble fitting your things, but it’s a tighter squeeze than you think. That’s because Targus felt the need to compartmentalize things a bit too much — the laptop goes in a sleeve that takes up most of one compartment, while the compartment in front of that is where most of your stuff will go. Another smaller compartment sits in front of that, with pockets for pens, ID, and other miscellaneous bits you may want to throw in. My usual loadout consists of the aforementioned 15-inch MacBook Pro, an iPad, a few notebooks, my Panasonic GF2, and a few extra lenses, all of which fit perfectly inside. The bag’s a great fit for a day trip (even the ones that involve lots of running around), but the Spruce definitely won’t be your bag of choice when it comes to going away for the weekend. Treehuggers, people who carry lots of small things instead of a few big ones, avid day-trippers. That depends — the price is certainly right (especially if you do a little poking around), but you’ll have to make do with some strangely-sized compartments. Still, it’s a mighty comfortable backpack for those who don’t feel an unwavering need to carry their whole lives around with them.